In 2012, Hurricane Sandy's devastating impact on coastal communities along the eastern seaboard forced cities in floodplains to reflect upon whether their communities were resilient. Rebuild by Design, the U.S. Department of Housing and Urban Development's (HUD) response to Hurricane Sandy, set the stage for innovative planning for resilience, resulting in The BIG U in New York. The BIG U team worked with one question in mind: How can we protect the city from flood and stormwater without blockading residential access to the waterfront? The Big Bench — a continuous protective element adapted to local context that mediates new and existing infrastructure. It is designed like street furniture: practical yet playful. 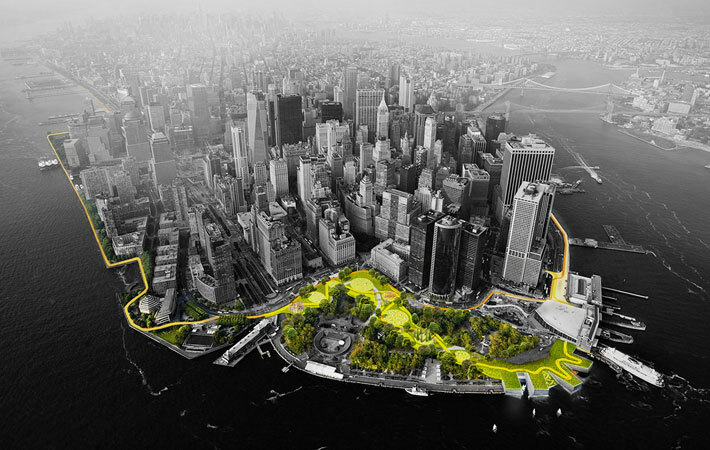 The Battery Berm — weaves an elevated path through the park, enhancing the public realm while protecting the Financial District and critical transportation infrastructure beyond. The Bridging Berm — rises 14 feet tall by the highways, connecting the coast and community with greenways and eventually capping the highway. 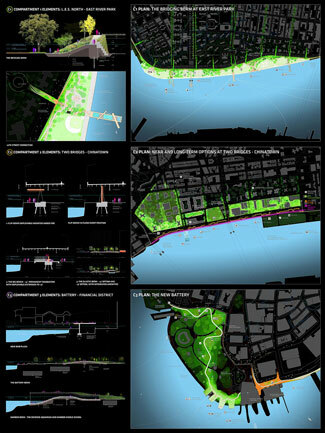 The team created three separate yet coordinated plans that physically isolate a compartment from flooding from another compartment, while simultaneously allowing for other interconnected social planning projects like maintaining sports fields for waterfront communities. The compartments work in concert to protect and enhance the city, but each compartment's proposal is designed to stand on its own. Aerial view of the BIG U. The resilience plan was designed with input from a variety of stakeholders in each compartment including neighborhood residents, businesses, and community groups. A joint planning group reviewed non-flood related plans designed for lower Manhattan to understand what residents needed in a vibrant community. Additionally, the joint planning group held a series of workshops that allowed residents and groups alike to debate the BIG U team's proposed solutions. Feedback from the workshops was later integrated into the final BIG U plan. The U.S. Department of Housing and Urban Development awarded the BIG U $335 million in federal funding to implement the first phase, the Lower East Side, which is compartment 1. With just the first phase of the BIG U, the value of avoided damages for the next 50 years would $778 million. With all three phases complete, the net present value of avoided damages for the next 50 years would be $1,912 million. In a time when resilience is more important than ever before, the BIG U provides a new model for integrating resilience within cities. The BIG U was developed in the Rebuild by Design competition by the BIG team, comprised of BIG Bjarke Ingels Group, One Architecture, Starr Whitehouse Landscape Architects and Planners, Buro Happold Engineering, Level Infrastructure, James Lima Planning and Development, Green Shield Ecology, AEA Consulting, Project Projects, and Arcadis. Explanation of the three compartments.